Romac's second generation two-bolt extended range coupling. USE Couple pipe ends with same or different diameters. WORKING PRESSURE Up to 305 psi. Ductile iron end-rings and center-ring have no welds. Heavy duty stainless steel bolts with anti-galling protection. 304 stainless steel armors are bonded to the gaskets. Center ring is fusion bonded epoxy in accordance with AWWA C213 & NSF 61 certified. End rings are E-coated epoxy. With a single gasket 4" - 12" Macro couplings accommodate IPS through cast iron pipe. XL sizes cover DI through Oversize Cast Iron. For larger pipe diameters such as some asbestos cement, a separate A/C gasket is included. The built-in handle makes the Macro simple to carry and maneuver during installation. Stab-fit installation. Each end of the Macro tightens independently with a single bolt. If your work space requires it, the end rings can be clocked. 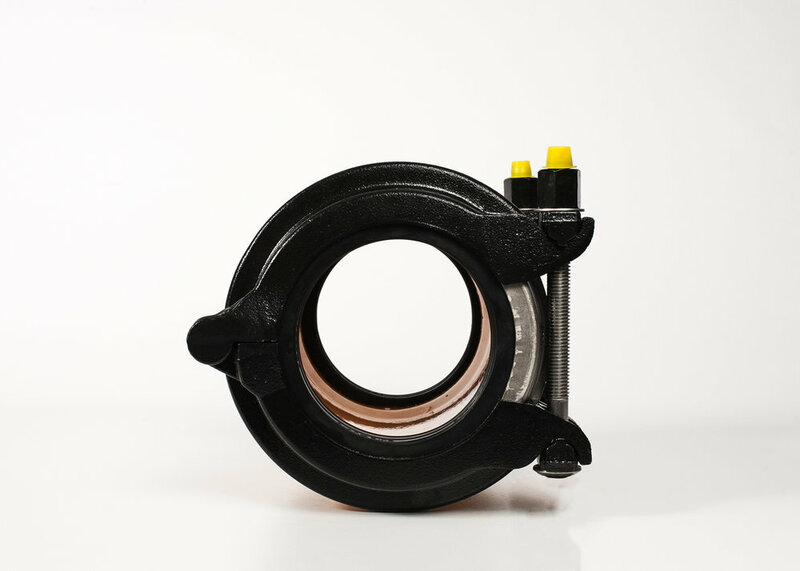 The Macro is lighter than traditional wide range couplings. Segmented end rings compress the gaskets evenly around the entire pipe diameter. The integrated hinge allows the Macro to be easily disassembled if necessary. The Macro can be ordered with an adapter/connection for cathodic protection if desired. The Macro can accommodate pipe deflection of up to 10 degrees (5 degrees on each end). CASTINGS All cast components (end rings, center ring, and bolt cams) are ductile iron, meeting or exceeding the requirements of ASTM A 536, grade 65-45-12. END RINGS 4 – 12 inch End Rings are segmented and joined with an integrated hinge. 2 and 3 inch use a type 316 stainless steel pin. The gap is spanned by the armor. CENTER RING Cast with integral handle for ease of assembly. GASKETS Gaskets formed from virgin Nitrile Butadiene Rubber (NBR) compounded for water and sewer service in accordance with ASTM D2000, also resistant to hydrocarbons. NSF 61 Certified rubber. Other compounds available on request. ARMOR Heavy gauge 304 stainless steel. BOLTS AND NUTS Type 304 stainless steel. 2 and 3 inch are 1/2-13 UNC, 4 – 12 inch are 5/8-11 UNC. All are carriage head bolts with heavy hex nuts. Fasteners provided with anti-galling protection. 316 stainless available on request. COATINGS Center ring fusion bonded epoxy in accordance with AWWA C213 and NSF 61 Certified. End rings E-Coated epoxy.